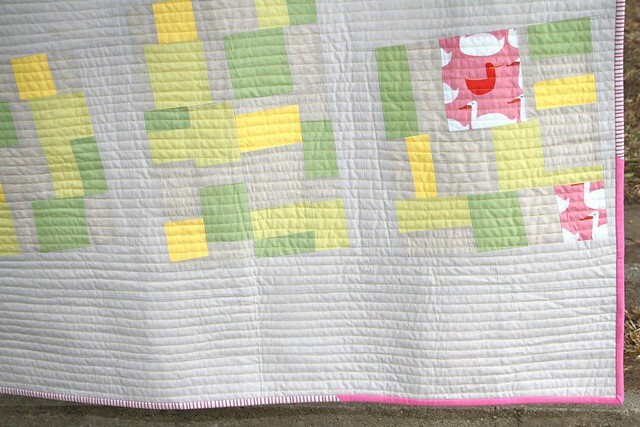 Finished up a little baby girl quilt! Named it Pink Less Greater Than (my math memory is definitely less than great and I got it backwards! Name adjusted!) because it looks kinda like a greater than symbol. 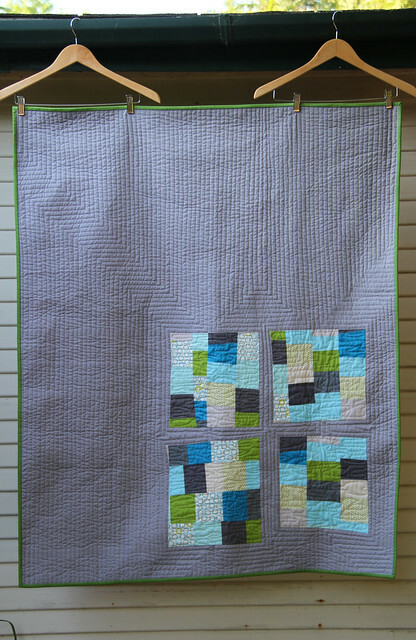 ...for my Modern Block of the Month awhile back and I wanted to make a whole quilt version. I foresee more exploration of this design in the future. 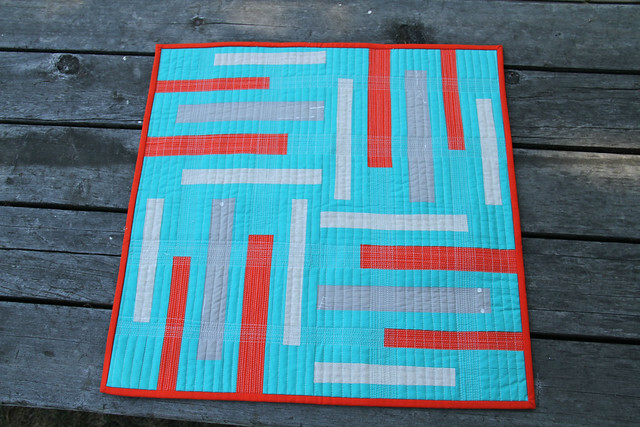 I had fun with the quilting on this one. 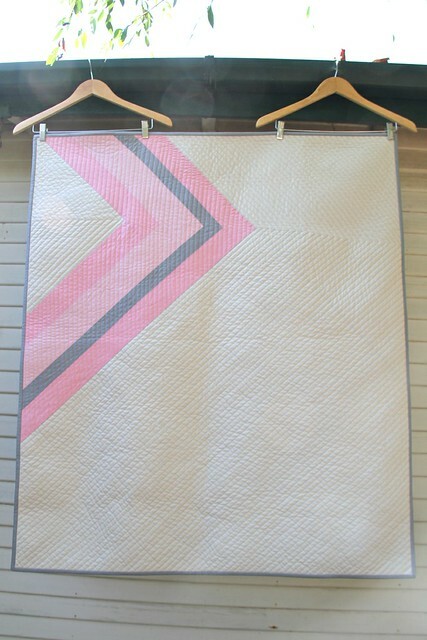 I echoed the piecing with straight lines in gray and then I filled in the piecing with vertical straight lines in pink. I was happy with how it came out! 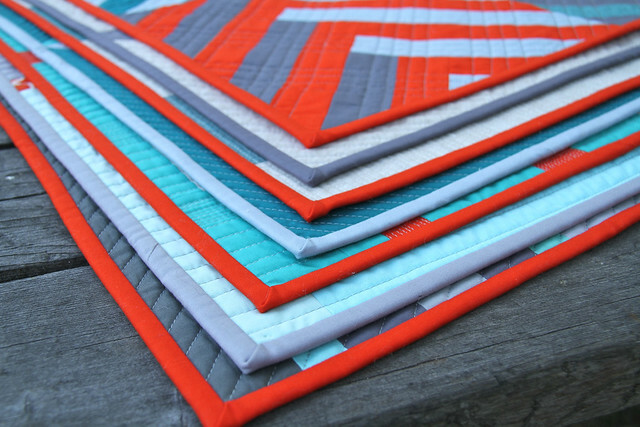 And speaking of my Modern Block of the Month, I'm going to be teaching all 12 blocks over the course of a year at Sew Modern! Every second Saturday of the month, from 2pm to 5pm. You can either sign up for the whole year, or just one month at a time! 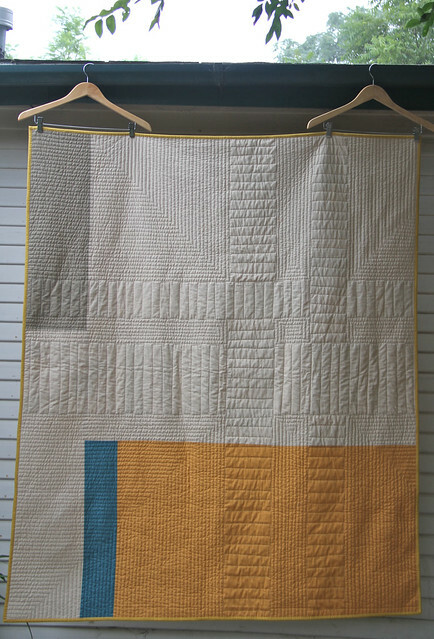 I finished up this quilt last week. I'd been working on it for quite a bit of time... 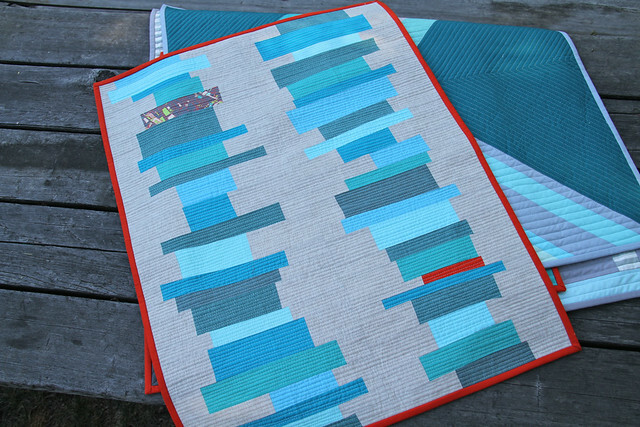 It's basically the quilt version of these placemats that are in Quilt Scene. 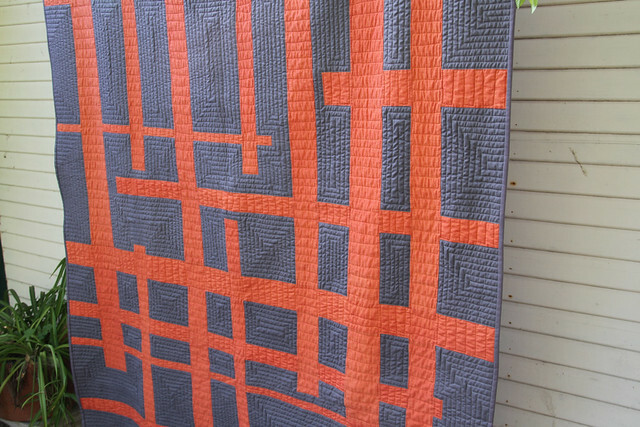 The quilting took me forever and I have to admit - while I love the results, it's hard to stay motivated to get this dense straight line quilting done. But now it's finished and I couldn't be happier with it! 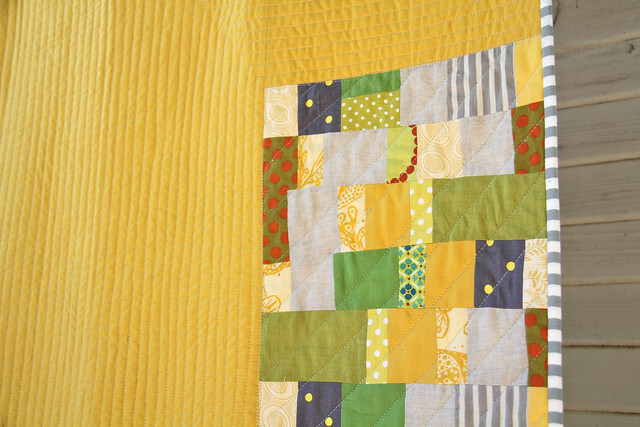 The orange is a shot cotton and in person really adds to the quilt - those shot cottons are so pretty with the depth of color they have. 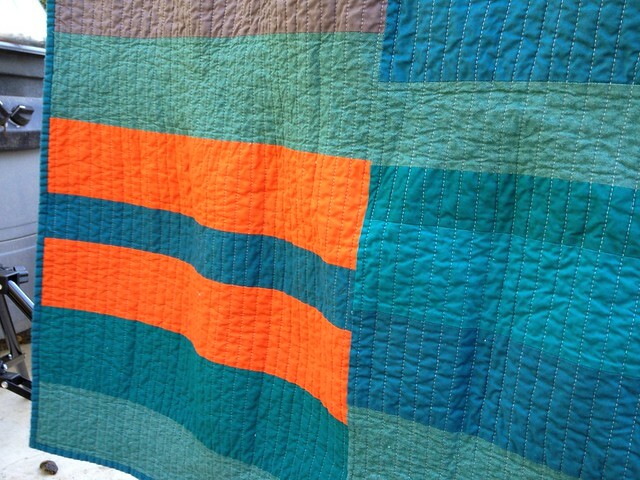 Here's a detail of the back... always easier to see the quilting on the back! 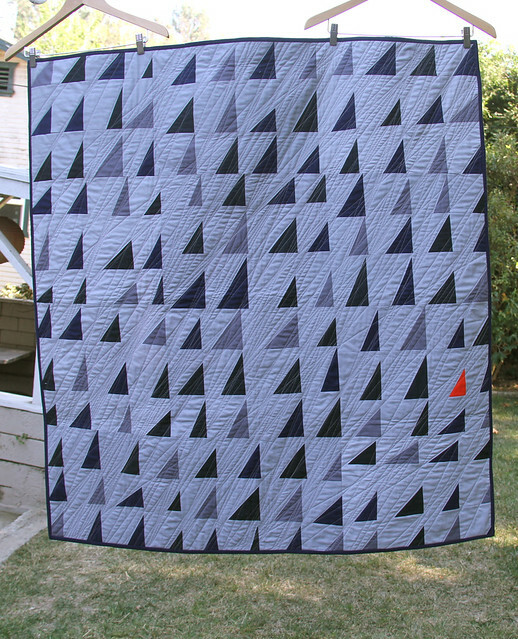 I finished up this quilt! 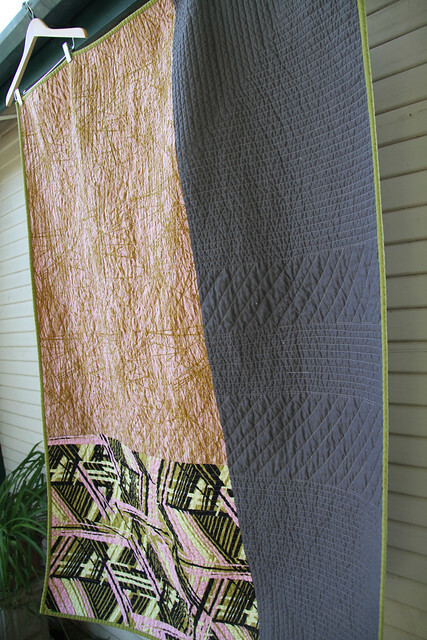 Lots of dense straight line quilting that fills in the piecing pattern and then continues across the rest of the quilt. 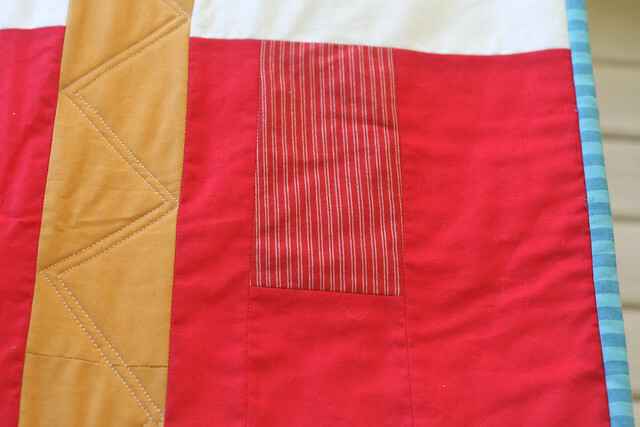 Here's a detail of the quilting on the back... All that stopping and starting with the straight lines takes a lot of time, but it's so worth the end results! The LAMQG had its November meeting last night. It was time for the reveal of our projects for the Habitat Challenge. You can see all of the projects here if you'd like. 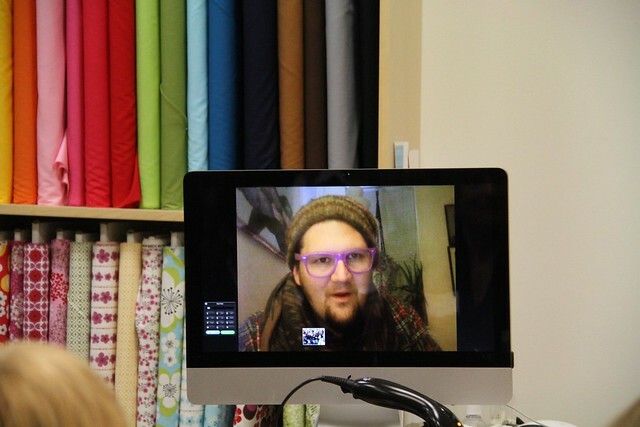 We Skyped with Jay McCarroll and it was a a ball...He is a total crack up. Then he hung out with us as we all showed our projects. He was so great about giving individual feedback to everyone! 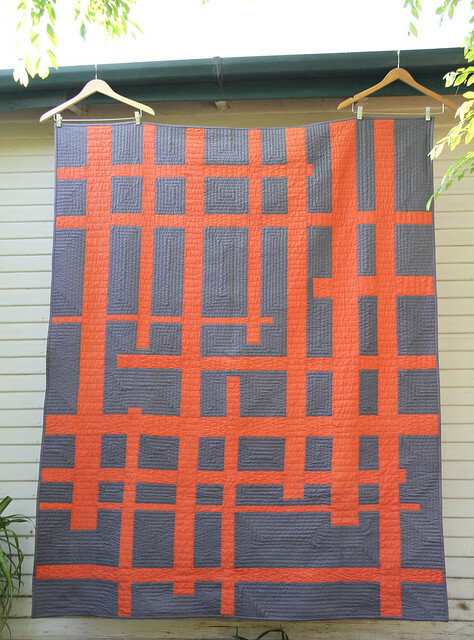 Here's the quilt I made. It's similar to the other one I recently made. For the challenge we were allowed to add all the solids we wanted, but only use the Habitat line otherwise. 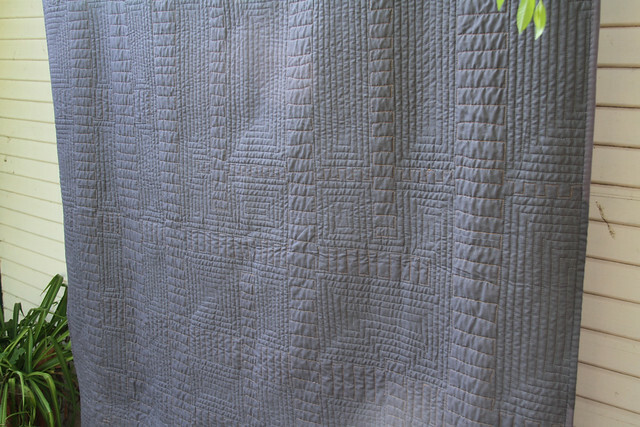 I took these pictures after washing the quilt so it's nice and crinkly! I used more of the line on the back, along with my go to Kona Coal. On to other things! 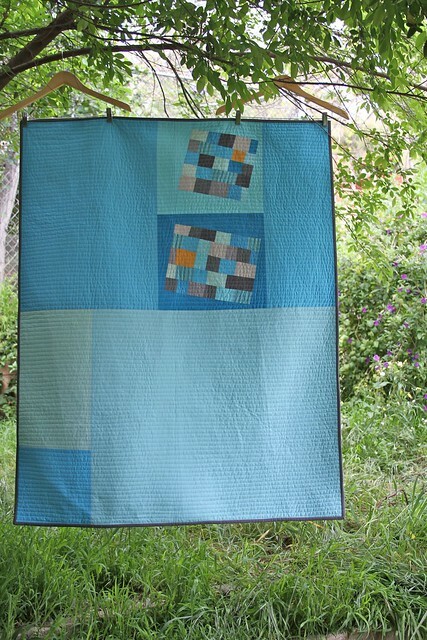 The winner of Quilting Arts' Quilt Scene magazine is Janine - keep an eye out for an email from me! 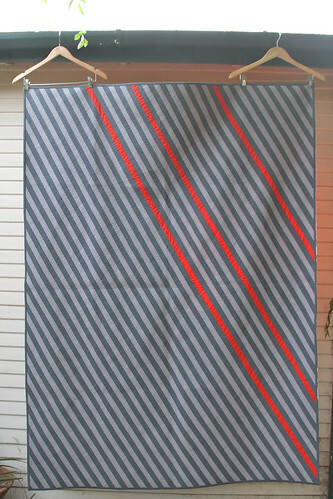 And finally, Action Kivu gets 50% of the proceeds from sales of jewelry from Ember Arts through Dec. 7th. They have some really beautiful jewelry - maybe you wanna do some Christmas shopping AND do a good deed? The LAMQG had its second anniversary meeting on Monday night. It's crazy how quickly those two years have gone by and how much The MQG has grown since then! We coordinated an anniversary swap and I was sewing for Liz. 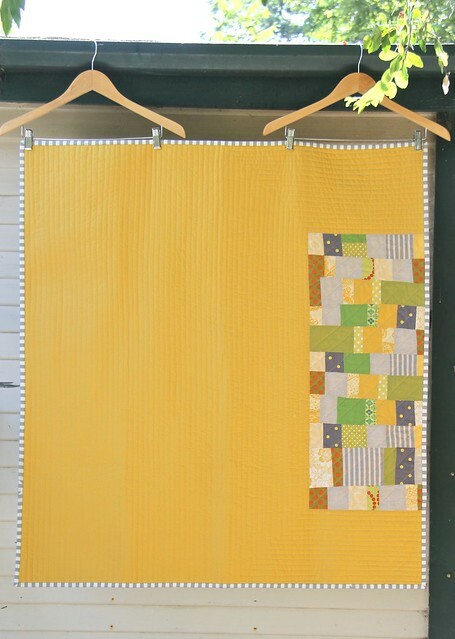 Her adorable little baby girl is right at the age where they can always use one more quilt to put on the floor, so I quickly put together a little one for her. 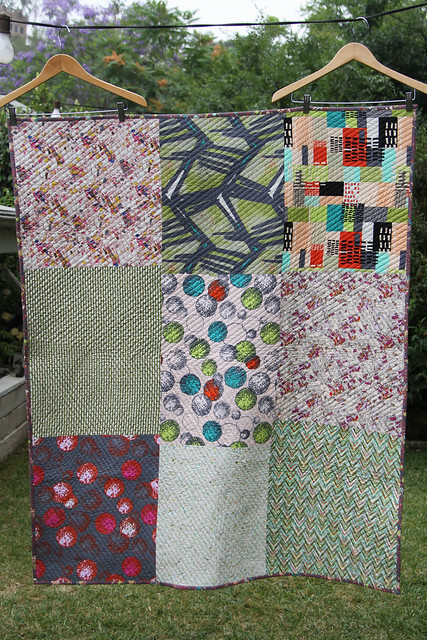 I had to use scraps she gave me and I could only add one new fabric. Obviously I added the yellow. Oh and I cheated and added the binding too. 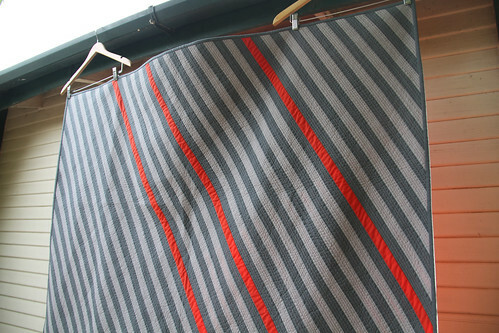 Figured a stripy binding was worth a little cheating! 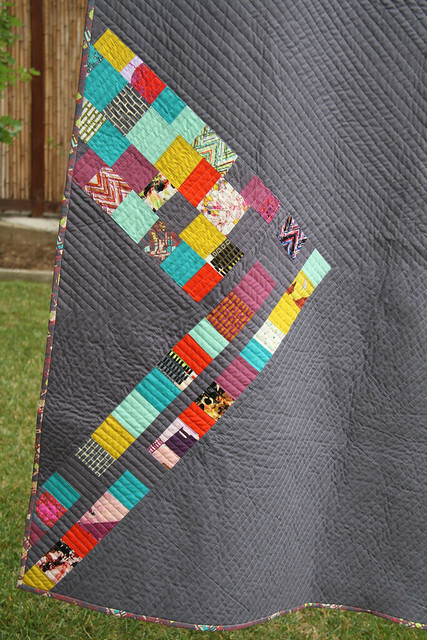 And thanks for all of your comments on the Quilt Retro blog tour post. I used the random number generator and the winner is Anita! Congrats and keep an eye out for an email from me. 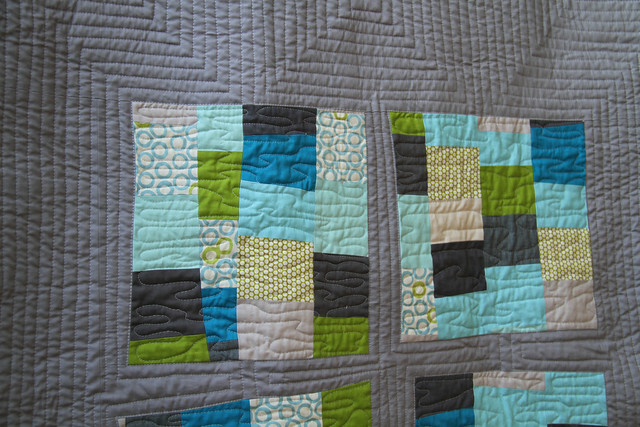 I have been leaning more and more on non-block based quilt designs but I also love to improv. piece so I have been thinking of ways to combine the two. 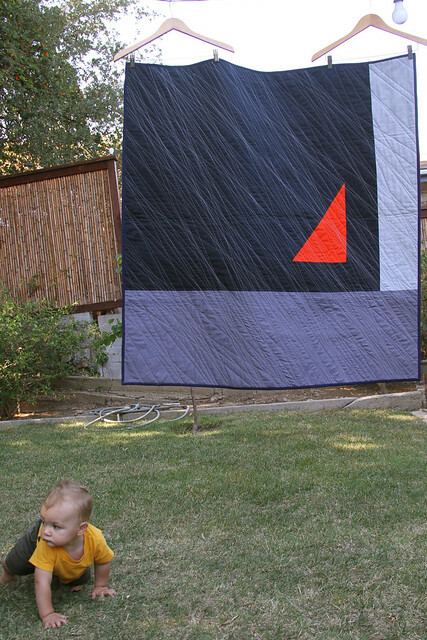 I feel like this quilt is a good example of that. Personally, I love it. 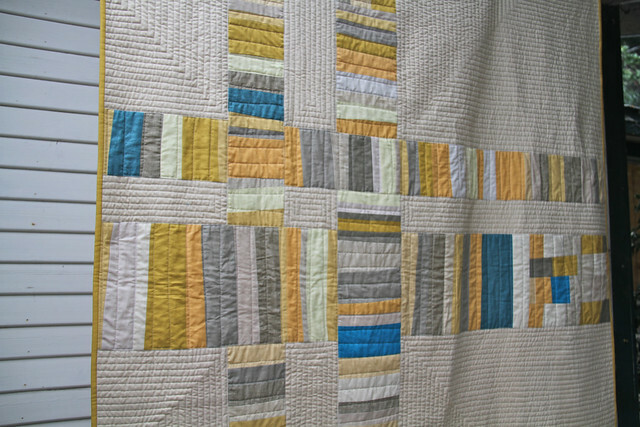 I quilted with dense straight lines (as usual - expect to see a whole lot more of this outta me - I'm loving it these days) and then less densely through the piecing. 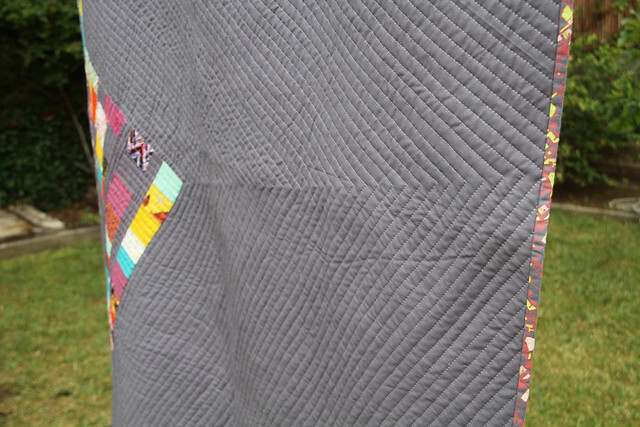 You can see the quilting really well on the back. 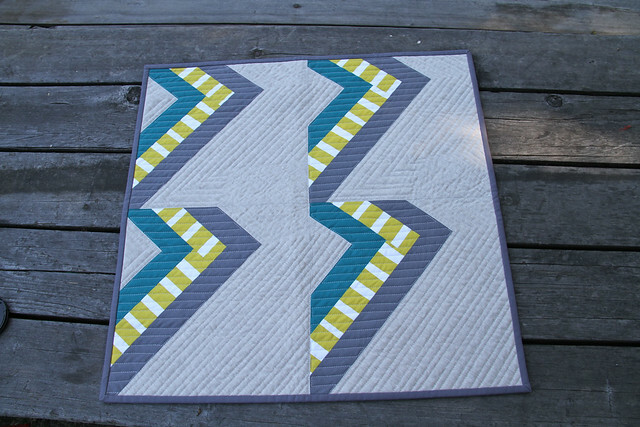 Sometimes friends having a baby have a great last name (Queen in this case) and you just gotta use it when naming the quilt! 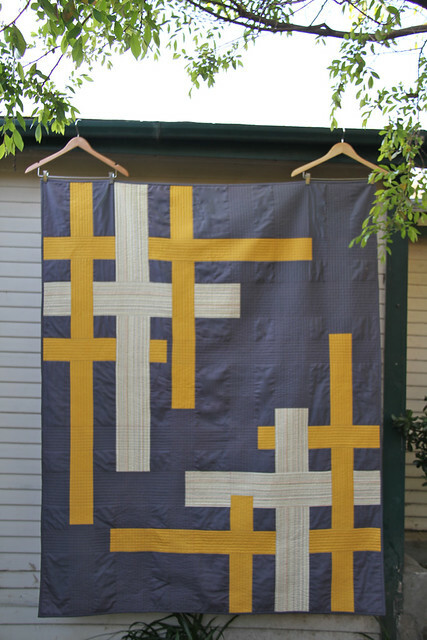 Well, that and the fact that I'm the absolute worst at coming up with quilt names and there you have it... 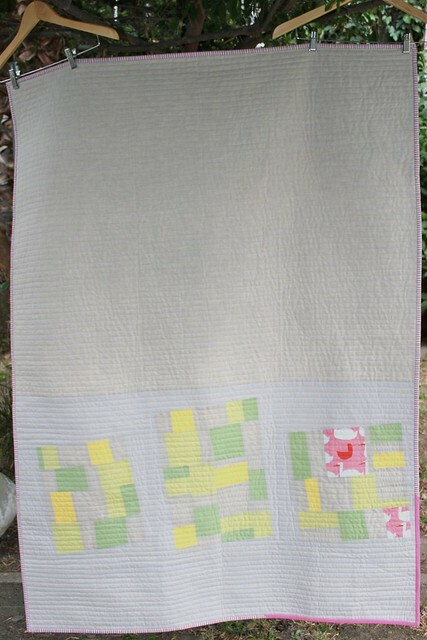 The Queen Baby Quilt! 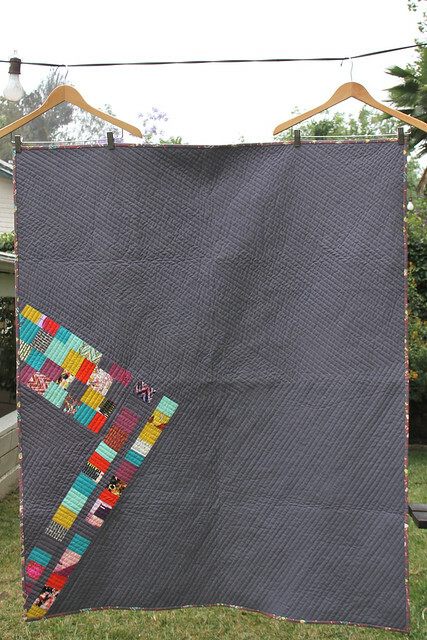 I loved the central gray sorta plus sign created in this quilt, and was doing that that again here. 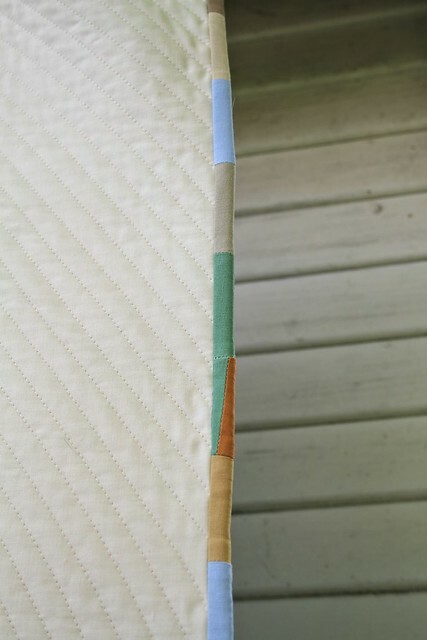 I was also exploring intentionally ever so slightly wavy seams. 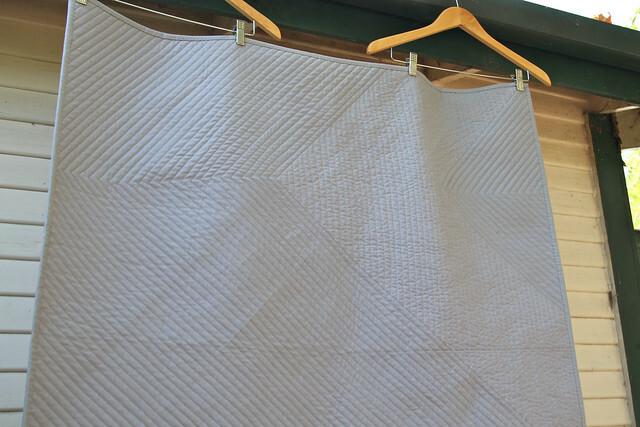 Not just cutting with no ruler, but also cutting both pieces of fabric at the same time (overlapping them a bit) before sewing them together. Fun stuff and something I'm gonna do more of. It's a subtle difference, but it does effect your "wonky" look and I'm ever continuing to explore that... It's endless that wonk exploration, isn't it?? 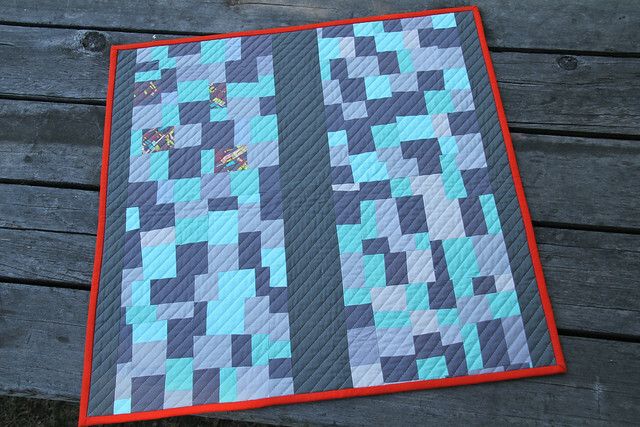 I did dense straight line quilting (yes, I'm stuck there right now) but I tried to mix it up a bit by outlining the blocks and then echoing that outline. 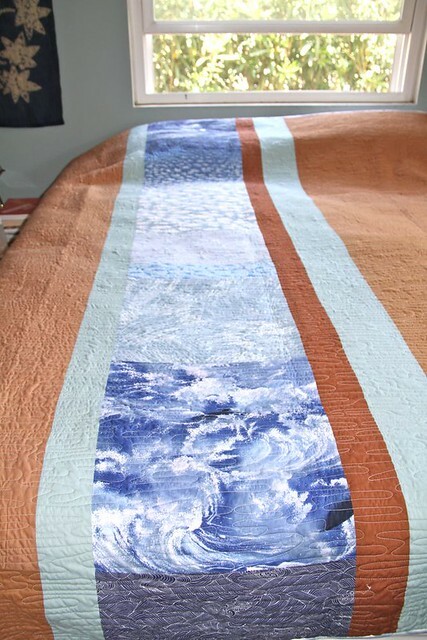 And I filled in the blocks themselves with the wavy watery pattern I just did on my mother's quilt. 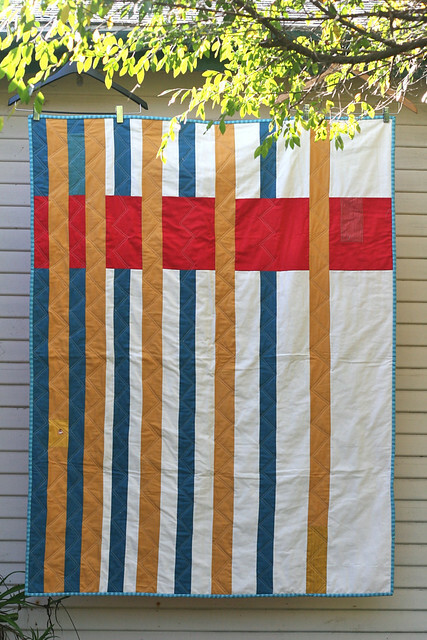 I will be handing this quilt off to its new lil' baby owner on Saturday and I hope he loves and cuddles with it for years. 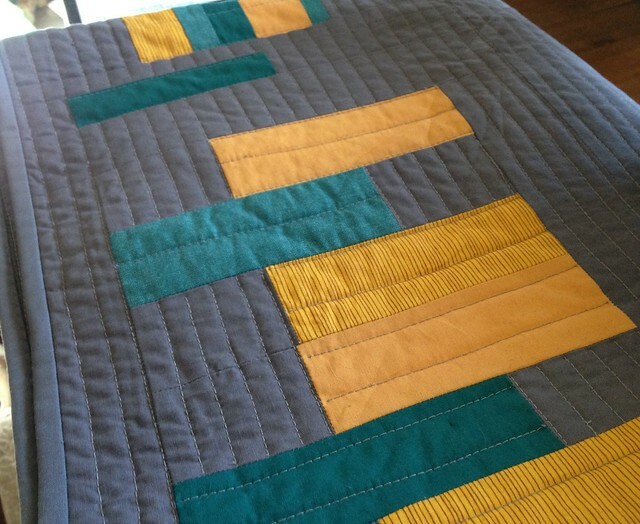 I finally got my mother's quilt all finished up! 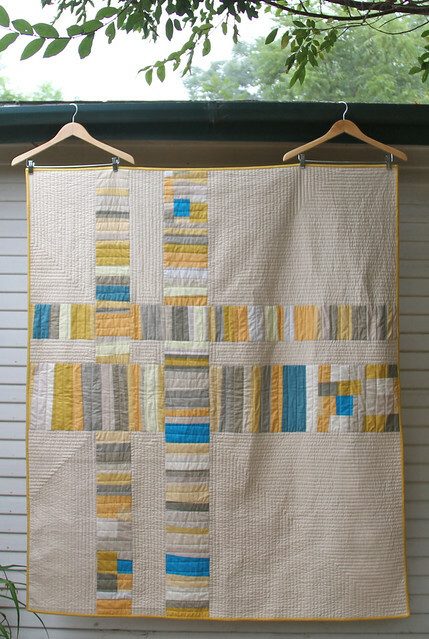 To tell the story of this quilt again, it's 100% fabric that my mother gave me. 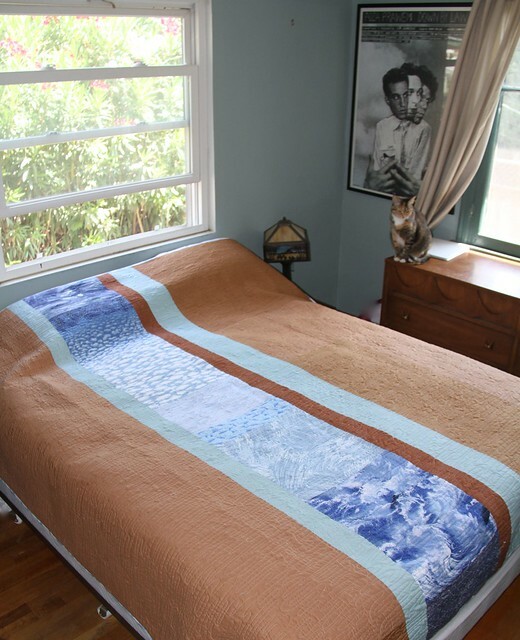 She had slowly collected fabrics with cloud and water imagery and she wanted them all in one quilt. 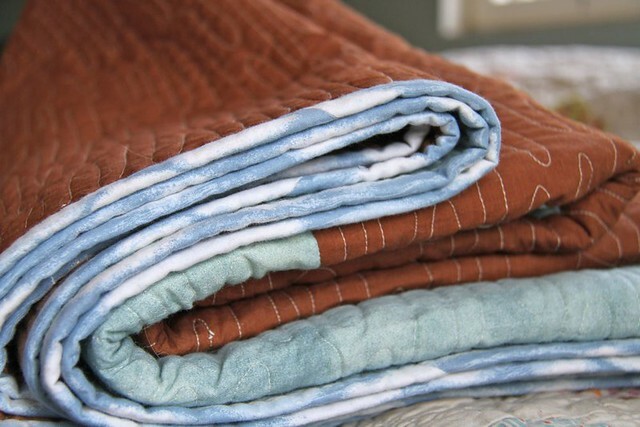 Along with the cloud and water fabric, she also had all of these solids and I knew I was going to lean heavily on them to make this a quilt that is my voice. I actually really love a challenge like this... 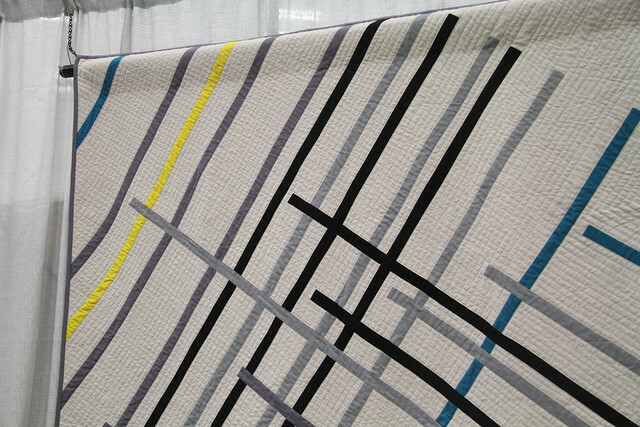 I like being given certain confines that I have to design within - it forces some of the decisions. It's a bit small for my bed here but it's just the right size for my mother's bed! 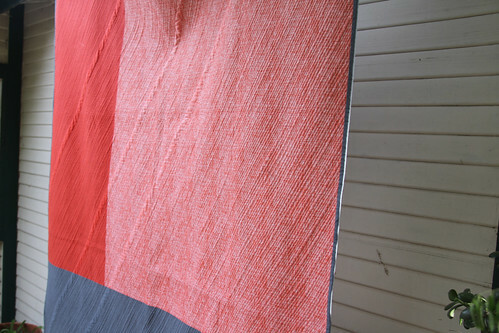 I wouldn't have picked these fabrics myself, but I'm really happy with the end result. 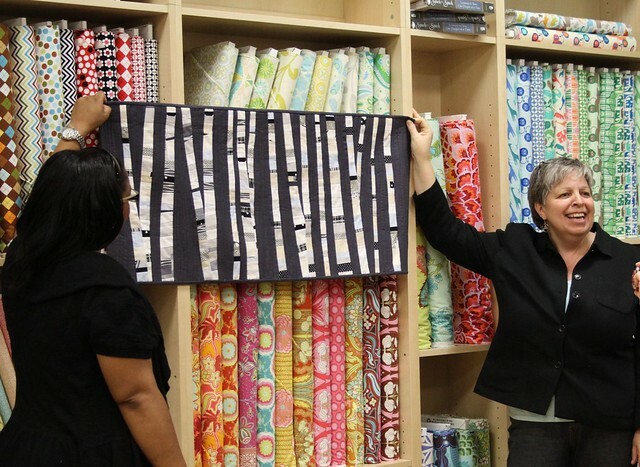 I really like the way the fabrics in the pieced strip go from dark, to light, to dark again and I think the fabrics are all featured well. Hope you all have a great weekend! I'm headed home to New Hampshire next week for a family visit. I can't wait!! Summer in New England...there's nothing better. Except the mosquitoes! 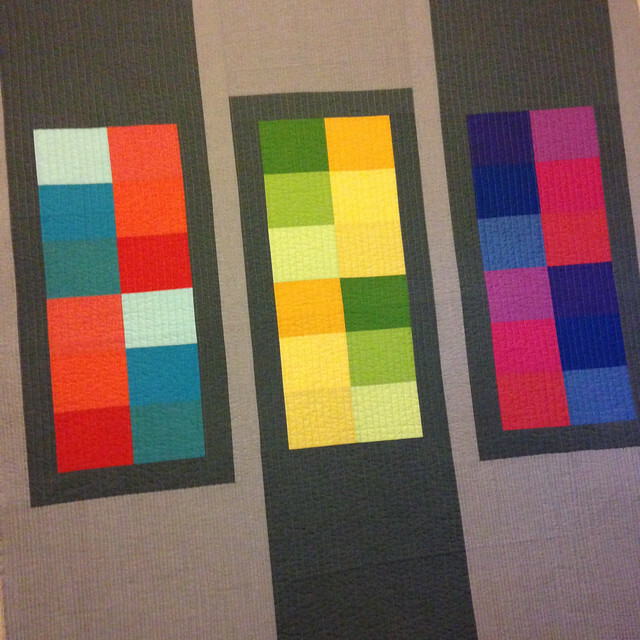 The Nice Baby Quilt is all finished. So simple. 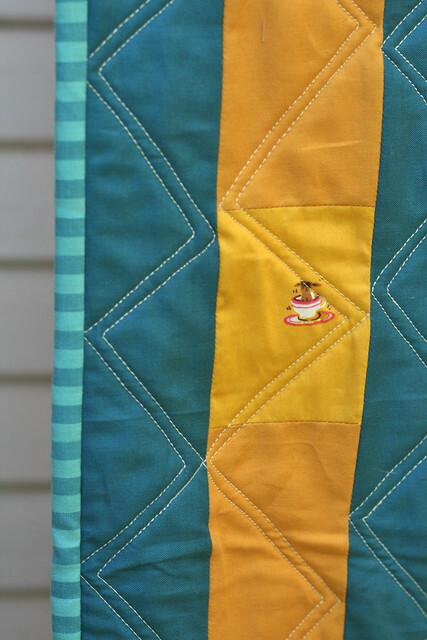 It was perfect for needing to sew up a quick gift for friends. 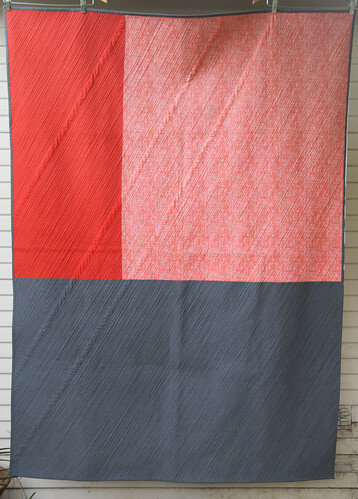 I used lots of linen and Kona Ash which are very close in value. 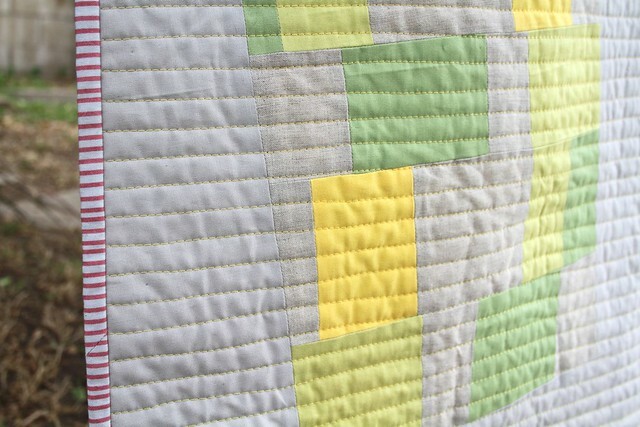 They really make the greens, yellows and bit of pink pop out of the blocks. 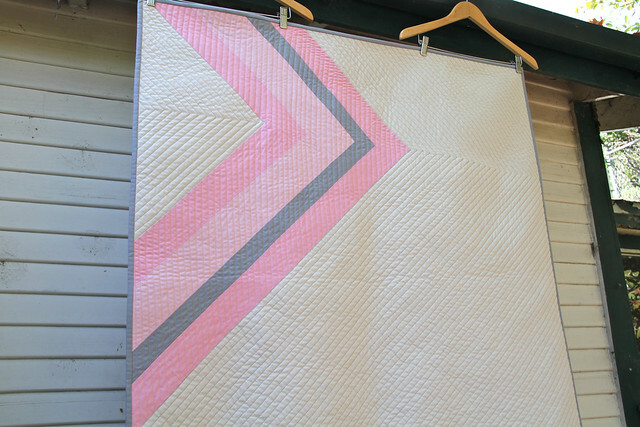 I used up my last bit of this Castle Peeps pink stripe with the binding and it was just a bit too short so I added some solid pink to make it long enough. 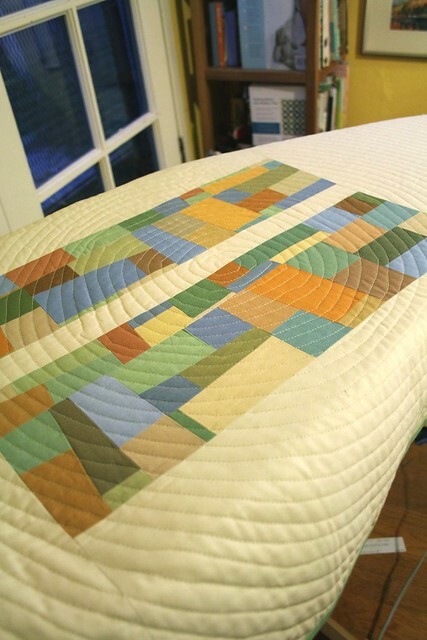 I'm finishing up my day job this week and will be back at full time quilting shortly! So many project and plans to tackle... I can't wait!! 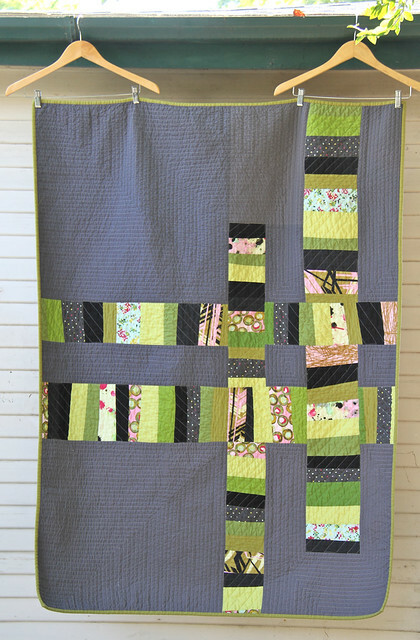 Lots of it in this quilt! Plus a little gray and just a tiny bit of golden yellow. 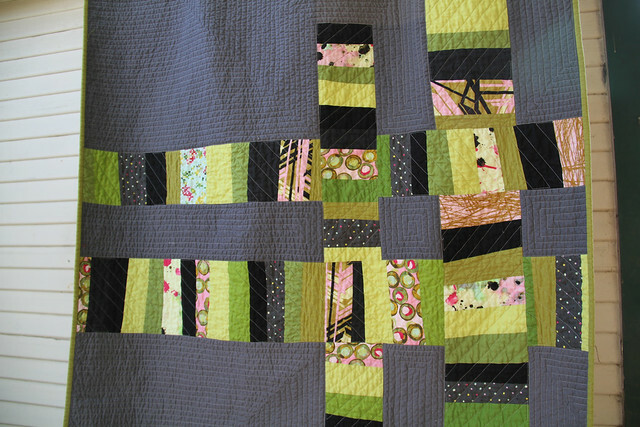 And I seem to be on a dense straight line quilting kick these days. 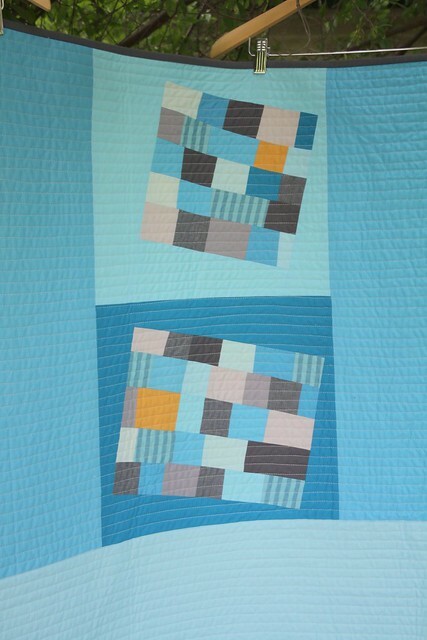 A friend from the LAMQG is adopting from Ethiopia and I made this quilt for Linus, her little baby boy! 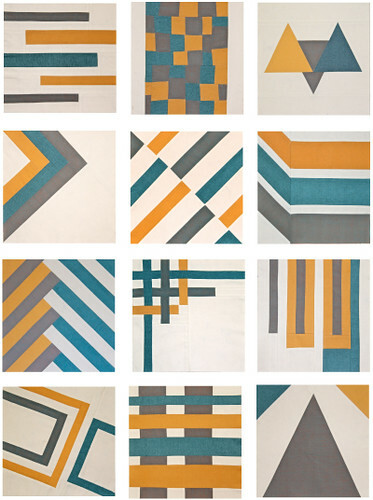 Otherwise, did you see that Challenge 3 of Project Modern was announced? Check it out here! 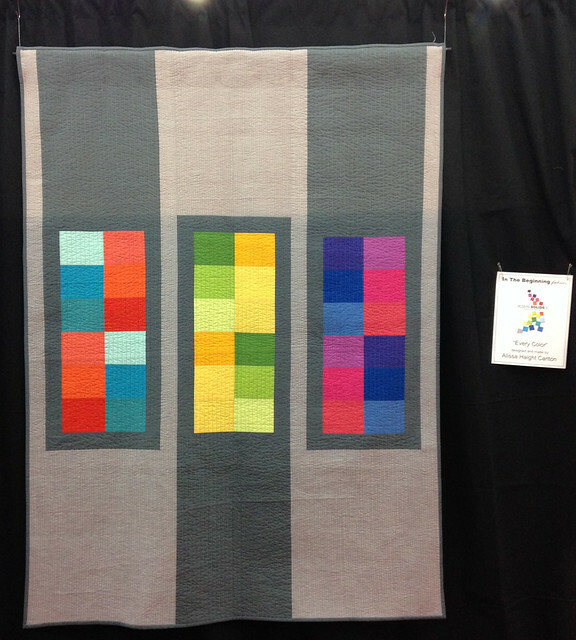 It was so much fun taking part in the Kona Cotton challenge that Robert Kaufman was generous enough to sponsor for many many of the Modern Quilt Guilds. Each group was allow to create their own rules for the challenge. Here in LA, we were each given one charm pack in the dusty palette. 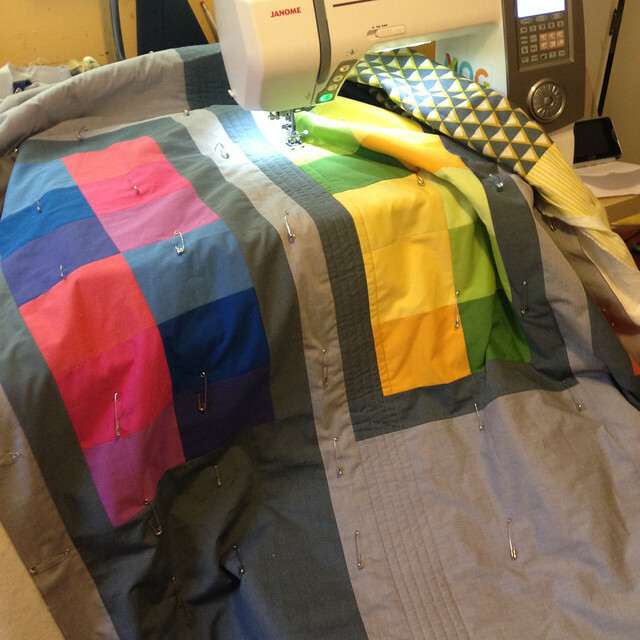 From there we were allowed to add one additional solid fabric in the quilt top, and one more for the binding. 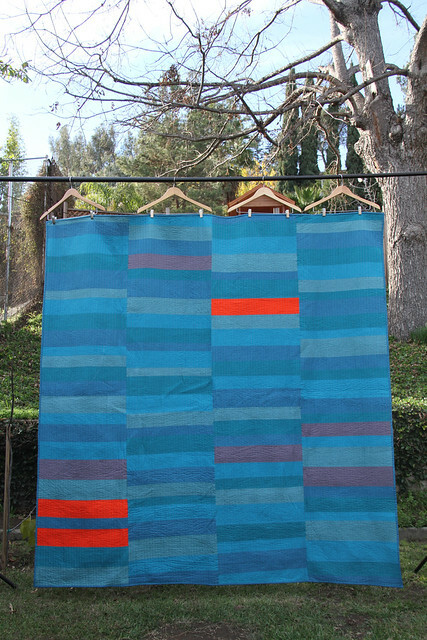 Here's the quilt I made. 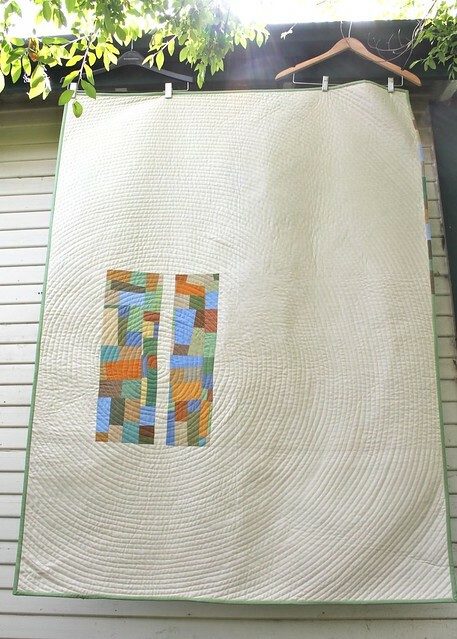 The quilting is 100% inspired by this quilt. 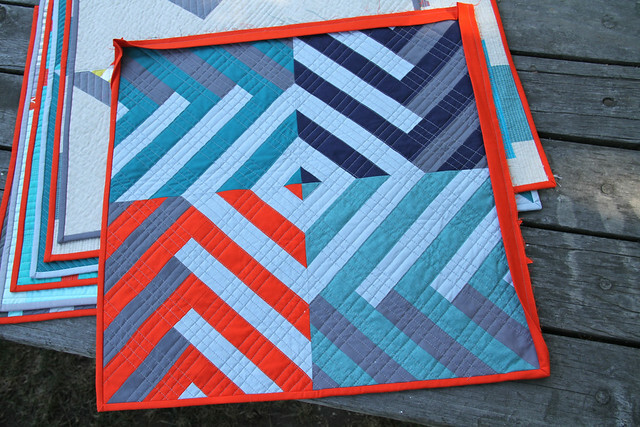 This type of random piecing is so much fun for me to do. 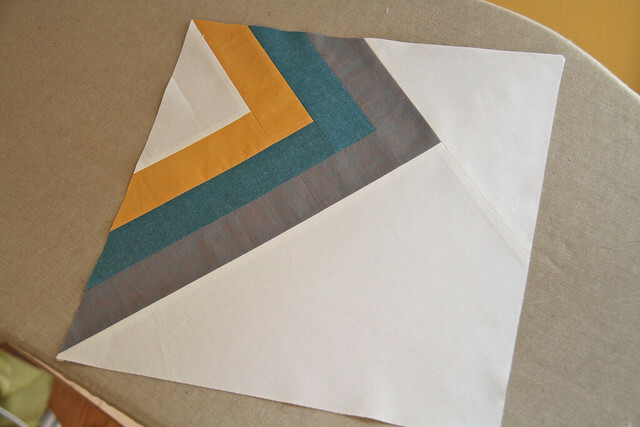 And I used some scraps from the piecing in a bit of the binding. There were so many amazing entries into the challenge. 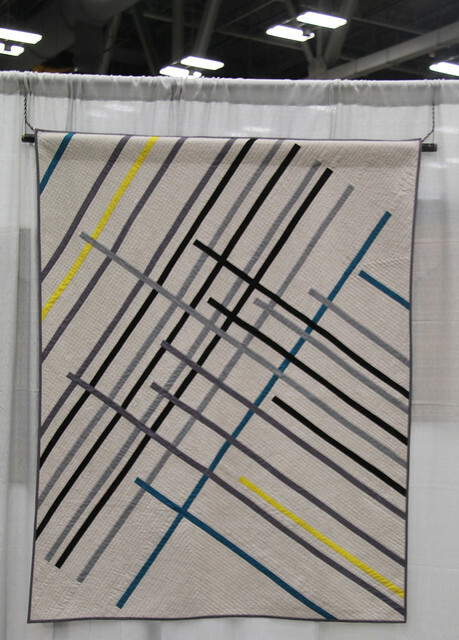 We had a lot of categories that the guild picked winners for but these are the two that tied for "best of show." Amazing, right?? So wonderful! And isn't it funny how much they work together?? They both picked Ash as their background! 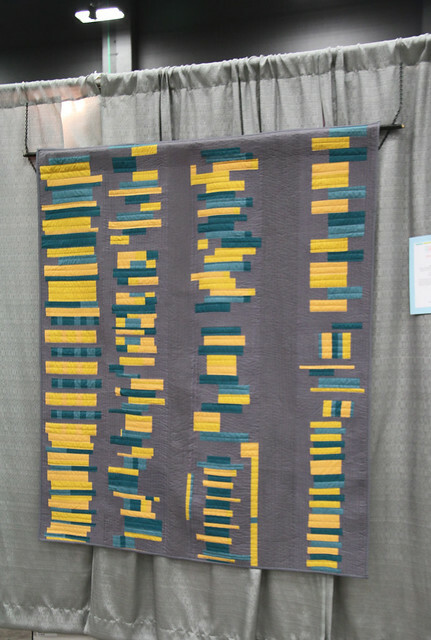 You can see all of the quilts that were made by The LAMQG here. 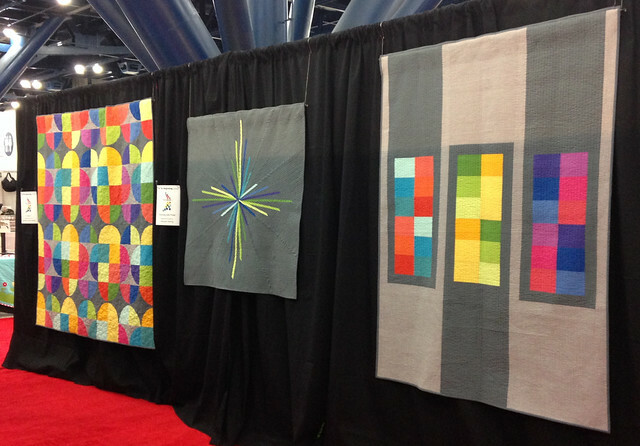 And there's also a flickr group for photos of all of the different guilds' challenge quilts. 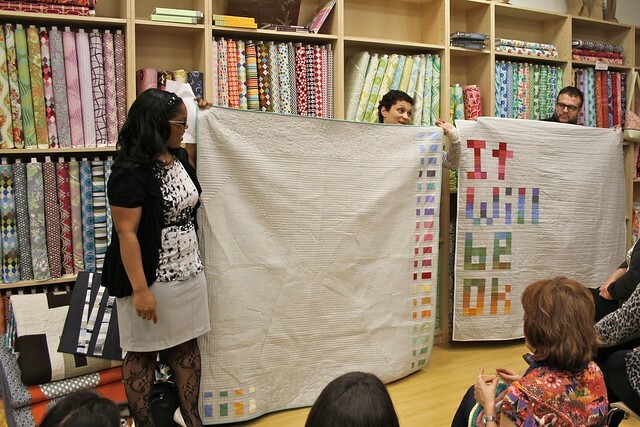 And here we all are showing off our quilts! Oh and Jacquie's talk? So so inspiring! I have been reading my friend Liz's blog, Lady Harvatine, for a long time. 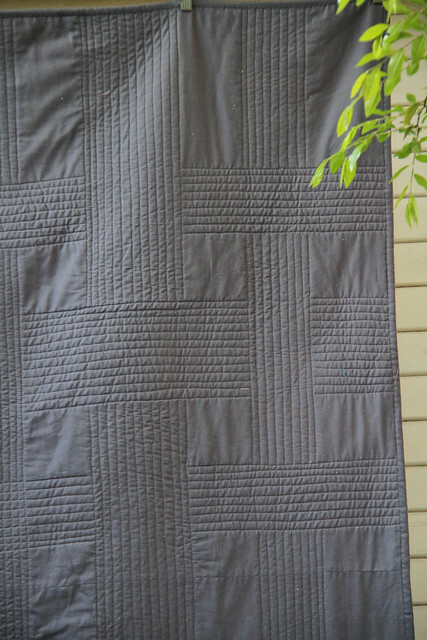 It was one of the first I found when I started quilting. 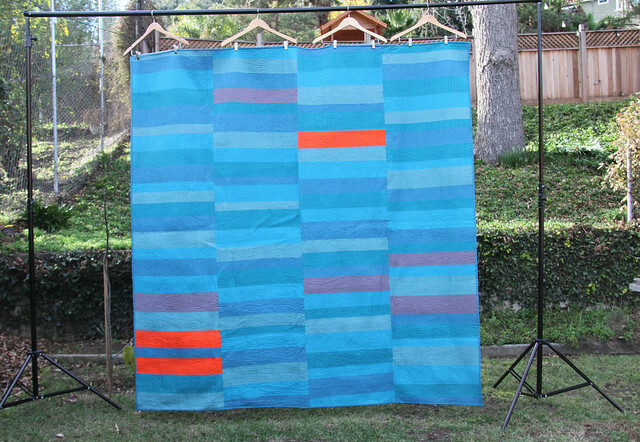 Thanks to the LA Modern Quilt Guild, we now know each other and are pals. 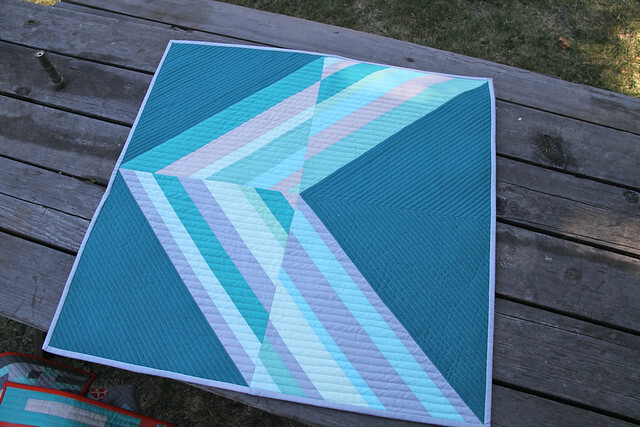 She's having a baby very soon, so of course I had to make her a quilt! 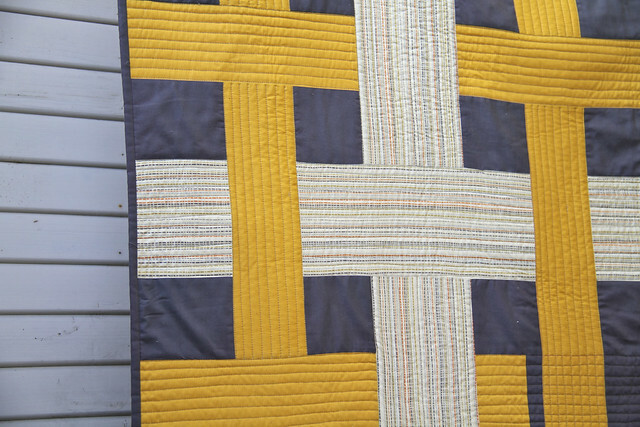 I quilted double zig-zags in each blue and yellow strip (I didn't use a double needle, just did one zig-zag then echo quilted it) and added the occasional pop of monochromatic fabric. Oh and guys, did you see? There's totally a dog in a teacup right there. Hope 2011 is off to a good start for you!